Black Canyon River Adventures, in conjunction with the Las Vegas Science & Technology Festival, is offering the Black Canyon/ Hoover Dam Postcard tour, a short smooth-water river rafting excursion on the Colorado River, on Science Is Everywhere Day, Sunday, April 29. The experience is FREE, but registration is required. Reservations may be made by calling (702) 278-0606. The tour includes spectacular views of Hoover Dam and the Mike O’Callaghan – Pat Tillman Memorial Bridge, as well as the majestic, rugged landscape of the area. Guests check in at the Alan Bible Visitor Center for the Lake Mead National Recreation Area (10 Lakeshore Rd., Boulder City, NV), and from there are transported down the historic Lower Portal Road to the Black Canyon Water Trail of the Colorado River. From that point, guests will board a motorized raft piloted by a guide for a 30-minute float trip. All guests should allow for 1.5 hours total for this tour from the park service parking area and back. Available tour times are 9:30 a.m., 11:30 a.m. and 1:30 p.m. on April 29; each tour time accommodates 45 guests. This unique excursion takes place aboard a motor-assisted raft that allows guests to leisurely enjoy and learn about the history, desert wildlife and beauty in the Black Canyon of the Colorado River. The tour takes place along the portion of the Colorado River designated as the Black Canyon National Water Trail by the National Park Service in 2014. Both full-day (4.5 hour) and “postcard” tours (1.5 hours) are available. The full-day trip covers 12 miles of the Colorado River and culminates at Willow Beach Marina on Lake Mohave in the Lake Mead National Recreation Area. A boxed lunch and transportation back to the departure point is included. Transportation back to your hotel is also available. 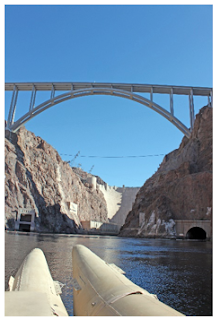 The postcard tour stays within ½ mile of Hoover Dam and offers spectacular photographic opportunities of the dam and the Mike O’Callaghan-Pat Tillman Memorial (bypass) bridge completed in October 2010. Forever Resorts is an exceptional collection of destinations providing hospitality services throughout the world. The company focuses on properties with access to nature and one-of-a-kind surroundings for vacations, including houseboating adventures. For more information, go to www.ForeverResorts.com, www.Facebook.com/ForeverResorts or follow on Twitter: @ForeverResorts.